London South Bank University (LSBU) has celebrated its membership of the Equality Challenge Unit (ECU)’s Athena SWAN Charter with an open event attended by over 100 staff. The ECU’s Athena SWAN Charter was established to encourage and recognise commitment to advancing the careers of women across higher education and research. The Charter is based on 10 key principles that recognise work undertaken to address gender equality in the broadest sense, not simply the barriers to progression that affect women. LSBU's membership of Athena SWAN demonstrates a commitment made at senior level to a progressive charter and the adoption of its principles within university policies, practices, action plans and culture. 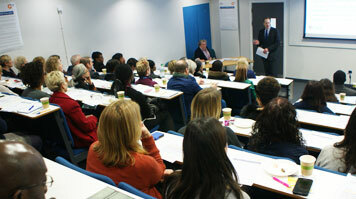 A series of presentations themed on the principles of the Athena SWAN Charter were given by Deputy Vice-Chancellor Pat Bailey, Professor Karin Moser, Head of Management, Marketing and People in LSBU’s School of Business, and Dr Calvin Moorley, Senior Lecturer in Adult Nursing, with presenters taking questions from LSBU staff. The event was the first in a series of planned Athena SWAN activities at LSBU, ahead of the university’s application for an institutional level Bronze Award in November. Find out more about Athena SWAN at LSBU.